What are Noa Panels about? 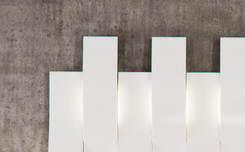 NOA’s panels are decorative wall / ceiling panels with an ambient lighting. Wavy structure, wide coating choice, embedded LED technologies. Natural wood as base material compressed into waves to give character to your wall design. What type of material are panels made from? Paint – Sayerlack wood coating. Veneer coating – reconstituted wood, that is “peeled” off controlled-origin species logs, dyed by immersion in non-toxic dyes and then “reconstituted” by overlapping the dyed sheets to form a new log. Standard panel measurements are 2447 mm x 200 mm, wave highest height is 100 mm, lowest height – 50 mm. Panel length can be regulated according to customer requirements. What is ambient lighting about? LED light is offered in two variations – white LED (12V, 19.2W per meter, 800 lumen, dual-color LED strip, can be changed between 3000 K to 6000 K), colorful LED (16 millions of colors change, brightness dimming, diferent color changing presets). How are panels packed for delivery? Standard package contains 2 standard ready to install panels and 2 mounting systems. Package weight is 17 kg, dimensions 220mm × 2500mm × 160mm. Our standard production lead time is 2–3 weeks depending on order size. The products are sent from Estonia so delivery lead time will depend on what country the order is sent to. Are NOA panels moisture resistant? Can they be used in bathroom? NOA panels can be made in moisture resistant variation by special order. How is LED lighting regulated? Backlight is regulated by special remote controls. There are different remote controls depending on LED color type. The remote uses 2.4G technology to control the lights directly. Can LED be replaced if broken? LED strips can be easily replaced. What does mounting/installation system look like? Panels can be installed on any kind of surfaces, such as concrete, drywall, block and wooden surface. Easy to install (smart mounting technology). Possible to dismantle and reinstall to another surface. Walls do not need special preparation. Panels with LED light need 220V power supply. Mounting unit standard length is 2247 mm, it weights 4200 grams. We can provide an installation service, it is subject to agreement. We are always ready to support you with advice and mounting instructions. Do you deliver NOA products anywhere? We deliver NOA products world wide. Depending on delivery site shipping fees may vary. Can I use NOA panels outdoors? NOA panels are not prepared to be used outdoors. How do NOA panels affect on room acoustics? NOA panels are not acoustic absorbing, but they influence positively by reducing echo sounds.